The government requires hedge funds and wealthy investors that crossed the $100 million equity holdings threshold are required to file a report that shows their positions at the end of every quarter. Even though it isn’t the intention, these filings level the playing field for ordinary investors. The latest round of 13F filings disclosed the funds’ positions on December 31. We at Insider Monkey have made an extensive database of nearly 750 of those elite funds and prominent investors’ filings. In this article, we analyze how these elite funds and prominent investors traded Bristol Myers Squibb Company (NYSE:BMY) based on those filings. Is Bristol Myers Squibb Company (NYSE:BMY) a good investment today? The smart money is getting more bullish. The number of bullish hedge fund bets moved up by 10 in recent months. Our calculations also showed that BMY isn’t among the 30 most popular stocks among hedge funds. BMY was in 58 hedge funds’ portfolios at the end of December. 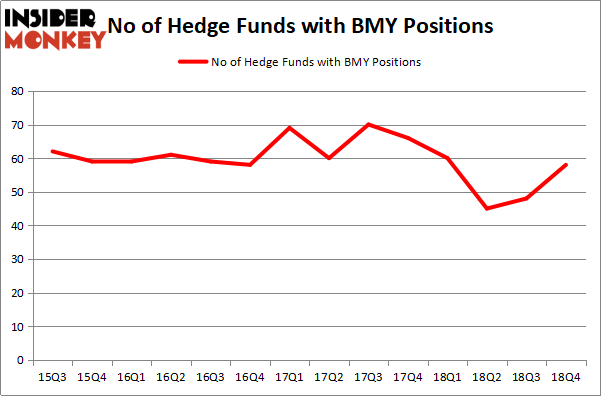 There were 48 hedge funds in our database with BMY positions at the end of the previous quarter. Let’s take a gander at the fresh hedge fund action encompassing Bristol Myers Squibb Company (NYSE:BMY). How are hedge funds trading Bristol Myers Squibb Company (NYSE:BMY)? At the end of the fourth quarter, a total of 58 of the hedge funds tracked by Insider Monkey were long this stock, a change of 21% from the second quarter of 2018. By comparison, 60 hedge funds held shares or bullish call options in BMY a year ago. With hedgies’ capital changing hands, there exists an “upper tier” of notable hedge fund managers who were adding to their stakes considerably (or already accumulated large positions). 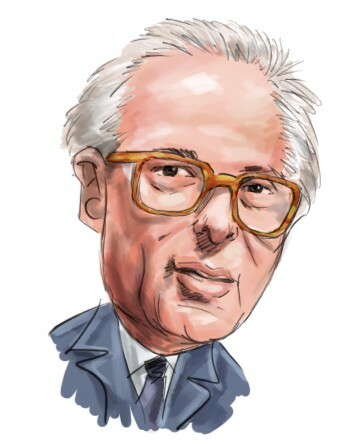 When looking at the institutional investors followed by Insider Monkey, Peter Rathjens, Bruce Clarke and John Campbell’s Arrowstreet Capital has the biggest position in Bristol Myers Squibb Company (NYSE:BMY), worth close to $767.5 million, accounting for 2% of its total 13F portfolio. The second most bullish fund manager is D E Shaw, managed by D. E. Shaw, which holds a $617.7 million position; 0.9% of its 13F portfolio is allocated to the stock. Remaining members of the smart money that are bullish consist of Cliff Asness’s AQR Capital Management, Israel Englander’s Millennium Management and Jim Simons’s Renaissance Technologies. With a general bullishness amongst the heavyweights, key money managers have been driving this bullishness. Camber Capital Management, managed by Stephen DuBois, established the largest call position in Bristol Myers Squibb Company (NYSE:BMY). Camber Capital Management had $52 million invested in the company at the end of the quarter. Jeremy Green’s Redmile Group also initiated a $44.4 million position during the quarter. The following funds were also among the new BMY investors: Arthur B Cohen and Joseph Healey’s Healthcor Management LP, Arthur B Cohen and Joseph Healey’s Healthcor Management LP, and Robert Pohly’s Samlyn Capital. Let’s also examine hedge fund activity in other stocks similar to Bristol Myers Squibb Company (NYSE:BMY). These stocks are CVS Health Corporation (NYSE:CVS), United Parcel Service, Inc. (NYSE:UPS), Banco Santander (Brasil) SA (NYSE:BSBR), and NextEra Energy, Inc. (NYSE:NEE). This group of stocks’ market caps resemble BMY’s market cap. As you can see these stocks had an average of 39 hedge funds with bullish positions and the average amount invested in these stocks was $1276 million. That figure was $3872 million in BMY’s case. CVS Health Corporation (NYSE:CVS) is the most popular stock in this table. On the other hand Banco Santander (Brasil) SA (NYSE:BSBR) is the least popular one with only 10 bullish hedge fund positions. Bristol Myers Squibb Company (NYSE:BMY) is not the most popular stock in this group but hedge fund interest is still above average. This is a slightly positive signal but we’d rather spend our time researching stocks that hedge funds are piling on. Our calculations showed that top 15 most popular stocks among hedge funds returned 19.7% through March 15th and outperformed the S&P 500 ETF (SPY) by 6.6 percentage points. Unfortunately BMY wasn’t in this group. Hedge funds that bet on BMY were disappointed as the stock returned -3.1% and underperformed the market. If you are interested in investing in large cap stocks, you should check out the top 15 hedge fund stocks as 13 of these outperformed the market. Here is What Hedge Funds Think About Cisco Systems, Inc. (CSCO) Should You Buy The Boeing Company (BA)? Were Hedge Funds Right About Merck & Co., Inc. (MRK)? Were Hedge Funds Right About Novartis AG (NVS)? Were Hedge Funds Right About The Coca-Cola Company (KO)? Do Hedge Funds Love Taiwan Semiconductor Mfg. Co. Ltd. (TSM)?